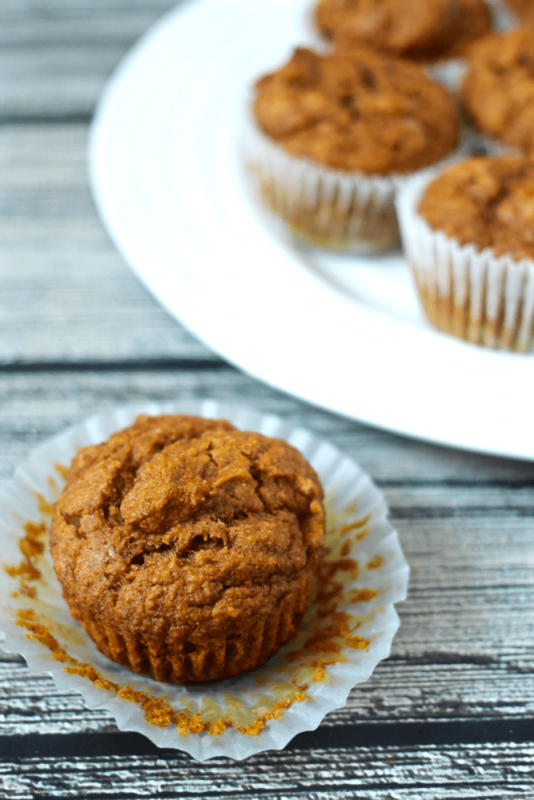 These 1-bowl whole wheat pumpkin muffins are moist and delicious! 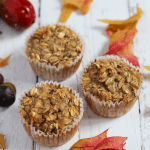 They are naturally sweetened, 100% whole wheat and perfect for a healthy fall breakfast or snack! My kids have been eating these since I don’t know when. Well, let’s see. You can’t give honey to a baby before age 1 — nor would I dream of letting an infant have honey or sugar — but I let M have sweetened things starting around 18 months. J a little earlier. Second baby 😉 So that’s when. Still, it feels like I’ve been making batches of these for ages and ages. It’s one of their very favorites and I know why. 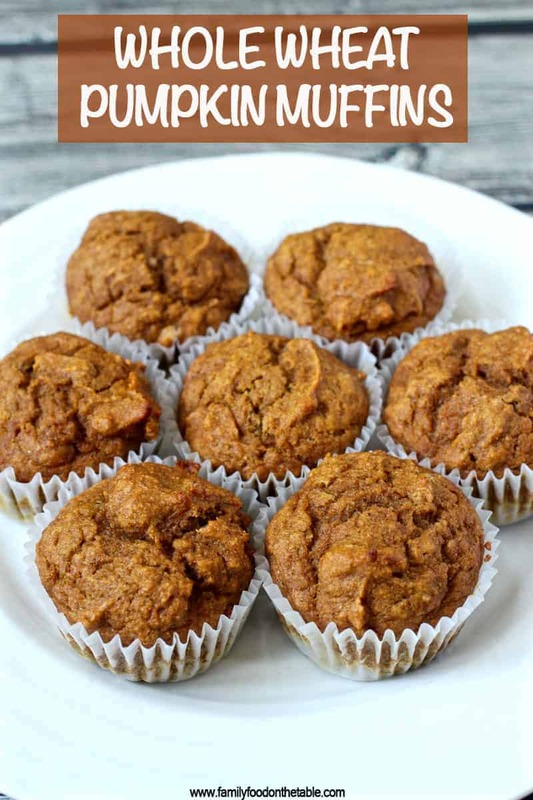 These are loaded with pumpkin and lovely spices and have a wonderful moistness to them. The oil makes them nice and hearty, too, and I feel good about giving them some healthy fats. And they make your house smell AMAZING! 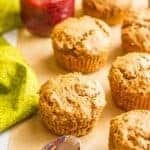 I use canola oil for these muffins. You could substitute vegetable oil or coconut oil if you prefer. If you want a lighter version for adults, you can sub part or all of the oil with unsweetened applesauce. If you want to bake this as pumpkin bread, instead of muffins, just pour the batter into a greased 9×5 bread pan and bake for 30-40 minutes, until a toothpick inserted in the middle comes out clean. You can add 1/2 cup chopped walnuts or pecans to the batter if you’d like. Pumpkin is a year-round thing in our house, not at all reserved for autumn. See pumpkin chocolate chip oat bars. A fave! 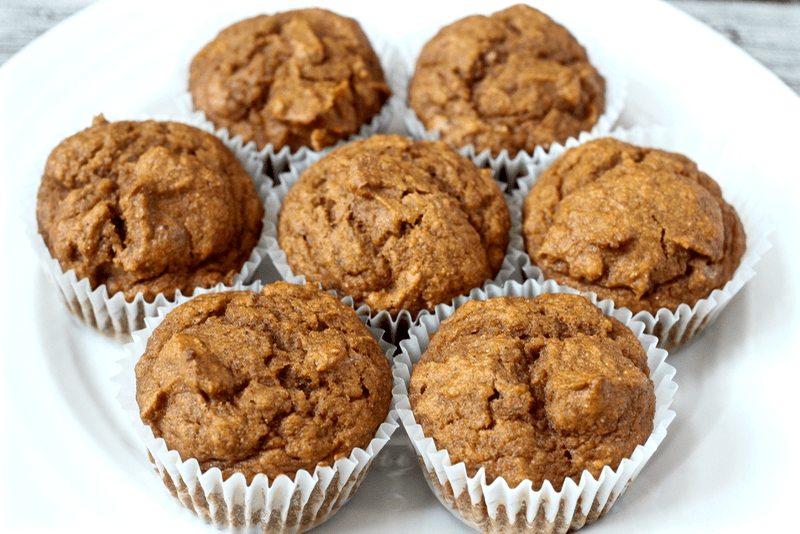 And these whole wheat pumpkin muffins are one of our “restaurant/weekend” lunches for the kids. We know it will make them happy and eating, so we can enjoy our food, too. Beet hummus does the trick, as well. 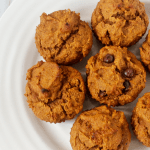 I’ve also got a peanut butter pumpkin muffin recipe, with optional chocolate chips, for a different twist! Plus, they freeze great. It’s so helpful to have healthy, homemade food like this on hand to make packing school lunch that much easier. Hope you get as addicted to these as we are! 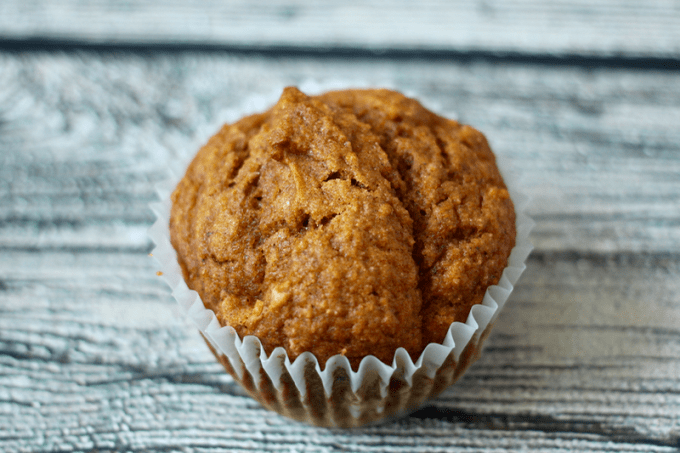 These 1-bowl whole wheat pumpkin muffins are moist and delicious! In a large bowl, combine the dry ingredients - the flour through the salt. Make a well in the center and add the eggs, oil, honey, vanilla and pumpkin. Stir wet mix together in the well and then stir together with the dry ingredients until combined. Don't overmix. Line a muffin tin with muffin liners and distribute the batter evenly. They will be about 2/3 full. Bake for 18-22 minutes, until a toothpick comes out clean. Let cool and store at room temperature for 3-4 days or wrap in aluminum foil and store in the freezer for up to 3 months. You can sub applesauce for part or all of the oil if you want to cut some calories. I used canola oil but you can use coconut oil if you prefer. Adapted from 100 Days of Real Food. 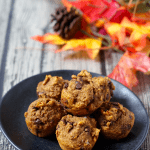 I love baking with pumpkin and that spice combo is just the best! Thanks Sammie! These seriously smell amazing when they are baking and fresh from the oven! So warm, so comforting, so delicious! I’ve made these three times already this fall. What a great use for our cooked up jack o lantern! Since I’m almost incapable of following a recipe, I did sub ALL the oil for applesauce. I also add raisins and pecans. They are amazing! Perfect for a mid morning snack, or even part of breakfast for the kids. Thanks!! That’s so great Jenny! We eat these on repeat ALL year long! So much for being seasonal… 😉 Love your substitutions/additions – will have to do that to mix things up! My husband and I are trying to cut down on sugar. I love this recipe except for the honey. Is there a substitute for it? Thanks! Just found your site today and love it! Hi Linda! Most baked goods needs some sort of sweetener. I use honey for these since it’s a natural sweetener. You could try substituting maple syrup or reducing the amount of honey a bit if you are OK with less sweet things. 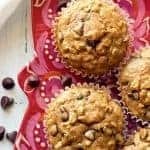 You could also try substituting mashed banana or unsweetened applesauce but I haven’t tried that and can’t vouch for the results. I hope that helps and would love to hear what you think! I’ve made these several times, starting with Thanksgiving breakfast, and they are a big hit. I’ve made a batch with chocolate chips mixed in, a batch with pecans, and tonight my son suggested mixing both in. I used all applesauce and no oil to make up for the chocolate chips and pecans. 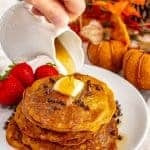 I also have used maple syrup in place of the honey as I love the flavor of maple with pumpkin.